Titanium & Wooden Wedding Ring : LOVE2HAVE in the UK! 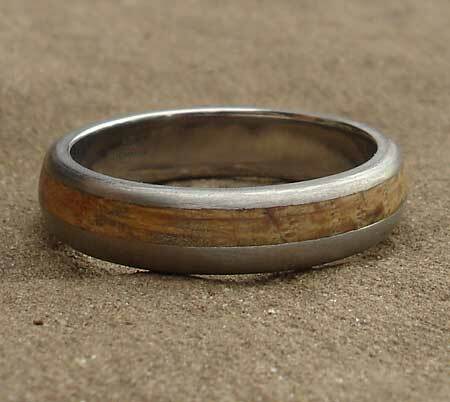 A titanium wedding ring with a wooden inlay for men or women. 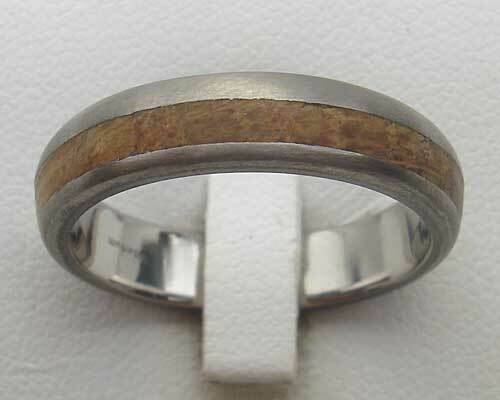 If you are looking for a unique wooden ring for a wedding ring, then this is the ring you need. This domed profile wooden inlaid ring has a beautiful offset inlay that takes up a good proportion of one side of the ring and is quite chunky. This model is the narrowest version of the domed ranges we sell which would be suitable for a woman, but men can wear this also. As the wood comes inlaid into the titanium, the titanium protects the wood from wearing away, unlike a wooden ring made entirely from wood only. This ring measures 5mm wide and comes inlaid with Oak that measures 2.2mm wide. The oak is inlaid into one side of the ring and contrasts nicely with the titanium. We have chosen oak as it is known to be a very durable type of wood, and therefore compliments the strength of titanium. The ring has a rounded profile, and the titanium has a satin matte finish. We sell other widths of this ring also but list this one at 5mm, a nice width for a ladies finger. Inlay/Width(s) Available: Oak, approx 2mm.